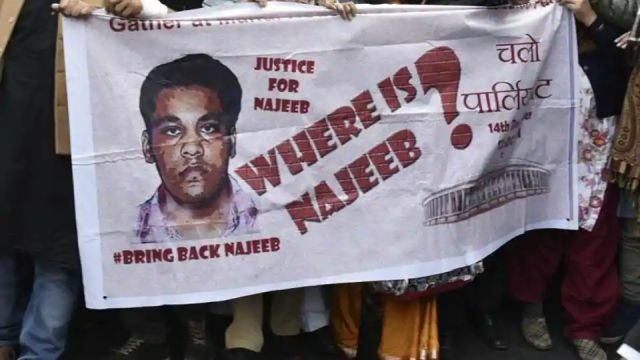 New Delhi : The CBI has submitted its closure report in the case over disappearance of Jawaharlal Nehru University (JNU) student Najeeb Ahmed, who went missing from here in October 2016, the agency said on Monday. Sources said the Central Bureau of Investigation (CBI) filed the closure report in the case last week, and the court will consider the matter on November 29. The agency’s move comes after the Delhi High Court on October 8 allowed the CBI plea seeking permission to file its closure report into the case while rejecting Ahmed’s mother Fatima Nafees’ plea for probe by a Special Investigation Team (SIT). The court had, however, advised Nafees to raise all contentions available to her in accordance with law before the criminal court concerned after the filing of the closure report by the agency. Initially, the Delhi Police had been looking into the case, which was later transferred from the CBI. Nafees had sought an SIT — comprising non-CBI official — to further probe her son’s disappearance from a JNU hostel in the intervening night of October 14-15, 2016. But the court declined the plea to constitute an SIT and monitor its work. Ahmed, 27, an M.Sc first-year student, was reported missing after an alleged scuffle with the Akhil Bharatiya Vidyarthi Parishad (ABVP) members, the student body affiliated to the Rashtriya Swayamsevak Sangh. The ABVP has, however, denied its involvement.